The Avalux GS completely frameless square/rectangular hinged shower enclosure with glass shelving series provides a contemporary, upscale showering experience in your existing shower space. Available in a number of sizes, the Avalux comes ready to install, complete with 10mm ANSI-certified clear tempered glass, chrome or stainless steel finish with stainless steel composite hardware, Self-Centering hinges, premium clear leak seal strips and engineered for reversible left or right-hand hinged pivot door installation. The GS class includes a two-tier glass shelving system with added convenience and sophistication. This model includes a 5 year warranty; base not included. Front Fixed Panel: 14" Glass Door: 23" Side Fixed Panel: 38 in. Give your bathroom a refreshed and modern look with The Aston Aquadica GS completely frameless square enclosure with two-tier glass shelving system. Available in a number of width/depth dimensions - from 30 in. to 38 in. - the Aquadica GS easily fits into your corner allotment. All models feature 10mm ANSI-certified clear tempered glass, stainless steel or chrome finish hardware, self-centering hinges,premium leak-seal clear strips and its entry hinged swinging door is engineered for reversible left or right hand installation. The Aquadica GS includes a two-tier glass shelving system. This model includes a 5 year warranty; base not included. 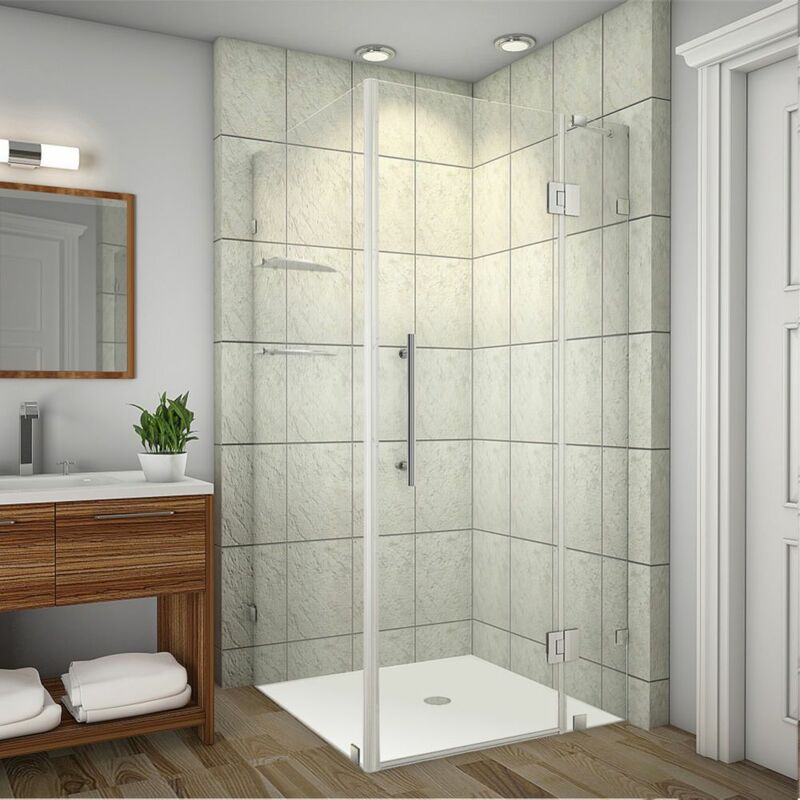 The Avalux square/rectangular completely frameless hinged shower enclosure series provides a contemporary, upscale showering experience in your existing shower space. Available in a number of sizes, the Avalux comes ready to install, complete with 10mm ANSI-certified clear tempered glass, chrome or stainless steel finish with stainless steel composite hardware, Self-Centering hinges, premium clear leak seal strips and engineered for reversible left or right-hand door installation. This model includes a 5 year warranty and base is not included. The Aston Avalux GS completely frameless square/rectangular hinged shower enclosure with glass shelving provides a contemporary, upscale showering experience in your existing shower space. Available in a number of sizes, the Avalux comes ready to install, complete with 10mm ANSI-certified clear tempered glass, chrome or stainless steel hardware, self-centering hinges,premium clear leak seal strips and engineered for reversible left or right-hand hinged pivot door installation. The Avalux GS includes a two-tier glass shelving system with added convenience and sophistication. This model includes a 5 year warranty; base not included. Add a desirable contemporary style to your corner shower allotment with the Aston Neoscape GS completely frameless neo-angle shower enclosure with two-tier glass shelving. Available in a number of width and length sizes - from 34 in. to 42 in. - the Neoscape GS will instantly upgrade your bath. All models feature 10mm ANSI-certified clear tempered glass, stainless steel or chrome finish hardware, self-centering hinges,premium leak-seal clear strips and its reversably enginered for left or right hand installation. The GS class includes a two-tier glass shelving storage system, to complete your new showering experience. All models come with a 5 year warranty, standard; base not included. Avalux GS 37-Inch x 38-Inch x 72-Inch Frameless Shower Stall with Glass Shelves in Stainless Steel The Avalux GS completely frameless square/rectangular hinged shower enclosure with glass shelving series provides a contemporary, upscale showering experience in your existing shower space. Available in a number of sizes, the Avalux comes ready to install, complete with 10mm ANSI-certified clear tempered glass, chrome or stainless steel finish with stainless steel composite hardware, Self-Centering hinges, premium clear leak seal strips and engineered for reversible left or right-hand hinged pivot door installation. The GS class includes a two-tier glass shelving system with added convenience and sophistication. This model includes a 5 year warranty; base not included.